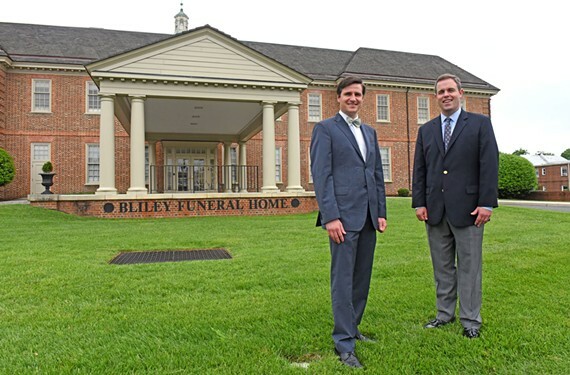 Eric and Carey Bliley are part of Bliley Funeral Home’s current generation. The business has been going strong for more than 140 years. Well over 100 years ago, three family-owned businesses — Cowardin’s Jewelers and the funeral homes Billups and Joseph W. Bliley Co. — opened to fill niches. It makes sense that two funeral homes and jeweler would thrive for generations. After all, everyone dies and who doesn’t like bling? But it’s a reputation for service and an ability to change with the times that’s given these ventures staying power. Billups Funeral Home was established in 1850 and has seen many cultural shifts in this old Southern city. Generations ago, cremation was taboo. Now it’s a common burial option, Tish Gresham says. She’s part of the fifth generation to work at Billup’s and says that compassion is essential. M. Carey Bliley, president and chief executive of Bliley’s, recalls tagging along with his dad at the business, now more than 140 years old. He says that the reward of serving others is something that’s easily passed down to future generations. The 49-year-old also notes changing burial traditions. In his grandfather’s day it was traditional to return a body to the family’s home for viewing after embalming. Now that’s a rarity. Bliley’s serves customers at four locations throughout the Richmond area. Cowardin’s Jewelers is in its 151st year of operation and has braved natural disasters, the Great Depression and the most recent recession. A former location downtown on Main Street was flooded out by hurricanes Agnes and Camille in the 1960s and 1970s. The business is now at 4909 W. Broad St. Fifth-generation jeweler L. Taylor Cowardin credits the ongevity to customer service, keeping up with trends and offering multiple services, such as appraisal and repairs.